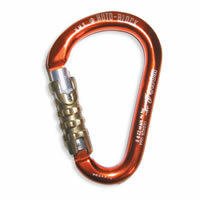 The Kong HMS Autolock Carabiner utilizes a spring loaded locking gate. This means quick opening and instant closing. The Kong HMS Autolock Carabiner also features a side-swing gate mechanism that creates a huge gate-open area. Because of its auto locking feature the Kong HMS makes a perfect rescue carabiner on or off the water. For the Clavey Gang, this is a "must have" clipped on our PFDs.